“The Horse” rushed for 3212 yards with a 4.8-yard average in college while also playing linebacker on defense in his junior and senior years. 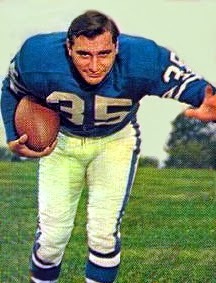 He capped his last season by winning the 1954 Heisman Trophy and was taken by the Colts in the first round of the 1955 NFL draft (third overall). Ameche moved directly into the starting lineup and made an immediate impression by running for a 79-yard touchdown on his first regular season carry. Colts went 5-6-1 to finish fourth in the NFL Western Conference. Ameche followed up with 858 rushing yards in 1956, averaging 4.8 yards per carry, and caught 26 passes as he again was chosen for the Pro Bowl. Adding to his effectiveness as a runner between the tackles was the improvement in his blocking, which was a concern during his rookie year. He was a Pro Bowl selection in each of his first four years as well as the key to Baltimore’s ground game as the club steadily improved. Ameche ran for 791 yards in 1958 and scored the winning touchdown in overtime against the Giants to win the NFL title. He began to show wear during the 1960 season, and an Achilles injury ended his career. Overall, he rushed for 4045 yards on 964 carries (4.2 avg.) and caught 101 passes for 733 yards, scoring a total of 44 TDs.